Both Viper and WARN are well-known producers of high-quality self-recovery winches. Viper as well as WARN offers the exceptional performance of winches able to master any terrain. And here you may face a dilemma, which one to choose. To take an informative decision, it is necessary to compare the models presented by two leading companies that have already gained a high repute on the off-road market. Viper or WARN: Which one to give a try? According to the winch owners who have tried both Viper and WARN, it may be concluded that both are of top-notch quality and even have a lot of similar features. Not identical but still there is much common among the producers who try to take into account all small details in order to satisfy all needs and wants of their customers. The main difference between the winch brands is the pricing policy. WARN winches costs more expensive compared to Viper winches presenting more budget winch series for those who are looking for the good quality at an affordable price. 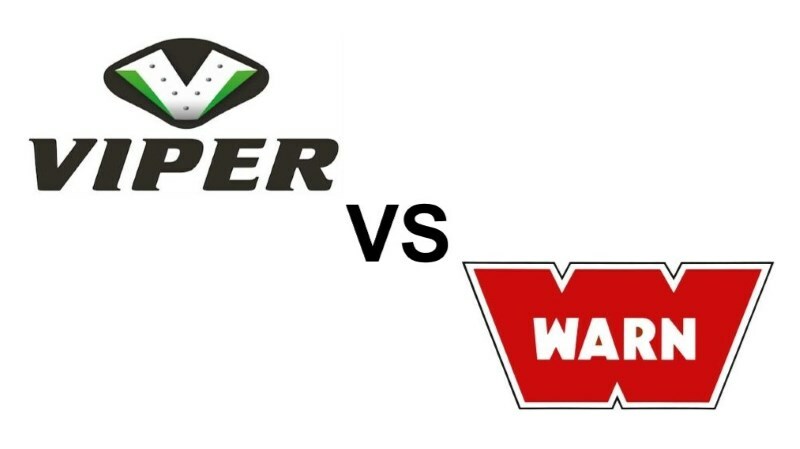 Let’s compare the most advanced series ProVantage produced by WARN and Elite series presented by Viper. It is known that ProVantage winches are of top-notch quality providing their users with the opportunity to enjoy their flawless performance, which lasts many years. You can rely on it facing any kind of trouble as this is the perfect choice for off-road lovers. ATV and Side x Side owners love this winch due to the innovative features and powerful pulling capacity it has. As for Elite winches from Viper, they are also known as the best in this class as they have all the features you may need. Due to the use of stainless steel, Viper winches have tremendous resistance to weathering. Thanks to the improved mechanisms Viper Elite will work anywhere and anytime of the year. You will be surprised by the high speed and reliability of the Viper winches. Elite winch from Viper is considered the top choice for UTV. As you can see from the specifications of WARN ProVantage, it is also able to meet the requirements of the choosy customers as the model refers to the premiere line of WARN. This winch can be characterized as strong, reliable and durable: the real pulling machine with easy-to-use clutch controls, corrosion black finish, full sealing for keeping elements out. It is an ultimate choice for ATV and Side x Side owners. Viper Elite has “whisper” quiet greasing system, which makes the work of winch almost soundless. Its AmSteel-Blue Synthetic Cable is easy to use. Its maximum load rating is up to 8,600 lbs. The mentioned winch features make it one of the most popular models among those vehicle owners who are looking for many upgrades at a reasonable price. Both models are known as good choices in their class. Perhaps, Viper Elite EX offers more advantages compared to WARN XT, however, the last one is also used for extreme off-road adventures quite successfully being able to pull the biggest ATVs using its 3000lbs pulling power. The patented disc brake provides great braking performance along with the effective electrical system, which is able to minimize drain on the battery. Viper Elite EX winch has the weatherproof sticker, paint and switches making the winch of this series look pretty good and operate well. Viper Max 2,500lb is considered an excellent choice for ATV/ Side x Sides thanks to its durability and reliability based on permanent magnet motors and steel gears. WARN ProVantage 2,500 lbs is the workhorse having premium components only, which makes it perfect for pulling heavy loads. It also has the permanent magnet motor and all-metal gear housing as the above-mentioned Viper Max winch. As you may notice, these models have some common features as well as differences, however, both of them are worth your attention as according to the reports of the owners who have used either WARN ProVantage or Viper Max, they have been satisfied with what they were offered. It may be concluded that either you choose WARN or Viper winch for your ATV or Side x Side, you are likely to be completely satisfied with the quality of components as well as winch design. Both producers pay much attention to details providing their customers with the best off-road accessories. If you are planning an extreme off-road adventure, it is recommended to choose among models presented in either ProVantage or Elite series of Viper. It doesn’t mean that other winch models are much worse, however, these series have shown the best results pulling vehicles out, regardless weather conditions. On the one hand, if you want to save getting a winch, you should choose Viper winches, which are the best value for money. On the other hand, WARN brand speaks for itself as winches of this producer have served faithfully for many years. I had both Warn and Viper winches and I can say that as my experience shows Warn is the best winch to give preference to. Perhaps, you will like Viper as well but as for me Warn worked flawlessly compared to Viper, which didn’t manage to help me as I expected. Warn is associated with high-quality. Warn winches cost more but they are worth money. I have used it for several years and I have never regretted my choice of Viper max 2500 lbs. It is enough powerful for ATVs. I can say that it is realiable and it can pull heavy loads. I haven’t faced any problems using it.